Big-time insult comic decides to write a book. A stand-up headliner since Jackie decorated the White House, Rickles is a comic commotion, liberally dispensing ad lib offense to all those hockey-puck patrons. In person, he murders. But in this knockoff autobiography, he bombs. 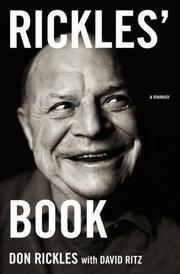 He tells us what we don’t want to know: that Don Rickles is a regular guy, a family guy, a human being. Out of Queens, and after the Navy, he was a feckless salesman before getting into show biz. He played the compulsory Jersey dumps attended by the dour mobsters who populate accounts of this sort. He booked bar mitzvahs in Brooklyn and weddings in Miami. He got an agent (in addition to personal representative Mom), gigs in Vegas and movies. Reputed to approach off-color material onstage, Rickles doesn’t work blue on paper. His yarn is bland, and the shallow writing—blame co-author Ritz—can’t be salvaged even when recalling great one-liners of yesteryear. In classic show-biz memoir fashion, names are dropped with abandon: Robards and Newhart, Carson and Sinatra (the Chairman of the Board at his most imperious), some presidents and a pope, even Mr. Potato Head. But a memoir isn’t the right format for this cantankerous old comic now into his ninth decade; Wikipedia may offer the better assessment of Rickles’ life. Those who just don’t get Rickles, and there are many, won’t be entertained. Fans, and they are legion, would do well to overlook this slight text, too. Get into the old tux, Rickles, and get back to work. And we say that, of course, with love.